The LeCroy SDA family of products, built on the world fastest Real time Oscilloscope architecture, delivers outstanding real time measurement solutions for signal with data rates up to 10 Gbit/s and combines the analysis capability of several different class of equipment in one single box solution. The SDA 18000 serial data analyzer is a true breakthrough in signal analysis. It delivers very high bandwidth (18 GHz), as well as a combined highest sampling rate of 60 GS/s and longest memory of up to 150 million points available in a real-time test instrument. Based on the most advanced digital oscilloscope platform in the industry, the SDA 18000 is a 4-channel real-time analyzer that offers outstanding analysis capability, accurate jitter analysis, and pristine signal fidelity up to 10 Gbit/s data rate. 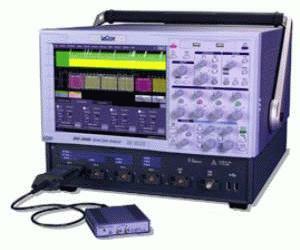 The SDA 9000 serial data analyzer delivers 9 GHz analog front end bandwidth with up to 40 GS/s and memory depths up to 100 Mpts/channel.